Forget about changing your dress for the reception - brides are now going one step further in their quest for a striking 'second look' on their big day by taking things to the extreme. 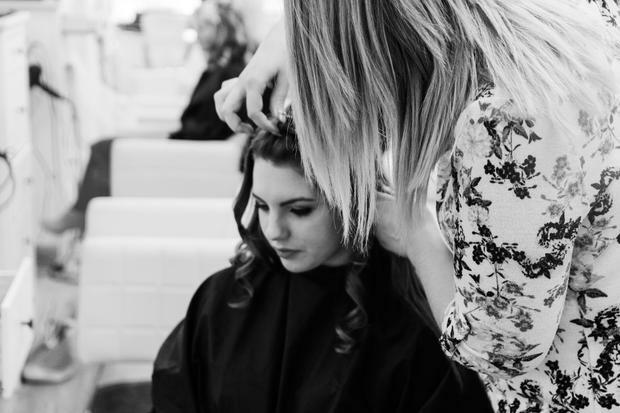 While for some brides, the idea of spending extra time on their hair and make up on the morning of the big day is an annoying but necessary task they want ticked off as soon as so they can let the festivities begin, others are fully embracing the idea of having their hair stylist on-hand on the day by taking the opportunity to debut a whole new look halfway through the wedding. In an interview with Refinery29, two brides revealed why they chose to go for the chop mid-wedding - with one even keeping it a secret from her groom until she was ready to showcase the dramatic style change. For blond-haired Kayla Cummings, it was simply a matter of having her stylist on hand on the day (her sister!) and wanting a second dramatic look for her reception. For red head Tracey it was about getting rid of her long boho locks to make way for a cool, casual look at the 'after party'. And if you're thinking who has the time on their wedding day to be getting a hair cut, know this - stylist AJ Cummings says the reason behind it is actually a case of saving time. She says most brides she styles on their wedding day want a change of hair style for their reception, and those same brides are almost always planning to chop their hair off after the big day, so why not kill two birds with one stone?